One day in the summer of 2000, I was suffering through a Team-Building Exercise at my then-job. This was in Florida. A Saturday. Everyone brought their families, which was at that point my daughter and my now-ex-husband. After the Forced Enjoyment, I needed a break, and the animal shelter was on our way home. "I need a puppy break," I said. I looked at puppies, I looked at cats, and there was Max, then named Tito; I knew instantly that he was my cat, but my ex insisted on a kitten, not a five-year-old cat, so we looked at kittens, and the kittens ignored us, and Max actually played with Elayna, and I've told this story before. I've told it a lot. I've been telling this story for 13 years. When my ex-husband was abusive, Max saved me. He snuggled me. He's always known when someone's in distress. He's always curled up in their lap for as long as they need. 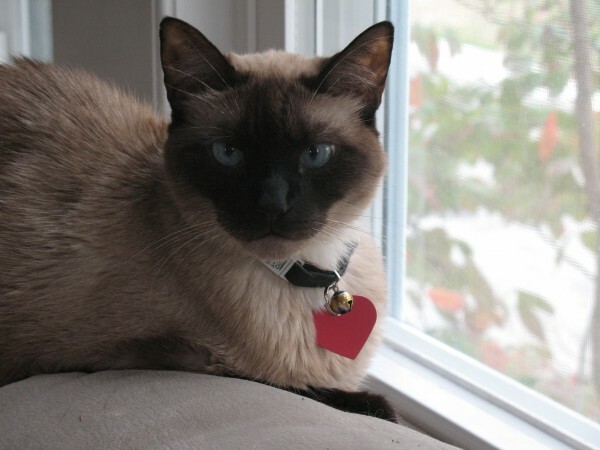 Many people have cried into Max's fur and been comforted by his purring. The day Judah hit me, after I got back from the courthouse, he sat in front of the door and guarded it all day. At night, when he was convinced that Judah wasn't coming back, he moved to my lap. Max has been with me through three states, five houses, two husbands. Max has outlived two kitty companions. Max is the reason I have a writing career - I started writing again to raise money for his jaw surgery in 2007. There is no way that I can capture, at all, how very much Max means to me, has always meant. He has been my constant companion. I have loved him more than I have ever loved any other pet - I loved Jack, I loved Tor, but Max was above and beyond. Max was part of me. Max was everything. He was diagnosed with kidney failure in July. We knew that he could go at any minute or go for another few years. There were times in the past few months where we were sure he was about to go - when he started having seizures, when he lost all that weight. He held on long enough to see Michael again and meet Lynne and Caitlin. He held on while I was in Chicago. He waited. He had one last Thanksgiving - Max loved Thanksgiving, and house concerts, and any occasion that filled the house with people. He loved people. He really did. If you ever met Max, know that he loved you. He waited til after Thanksgiving. Yesterday he took a downturn. He was weak, goopy-eyed, shaky. He couldn't get back up to his perch on the TV stand. When I kissed him goodnight, he cried. 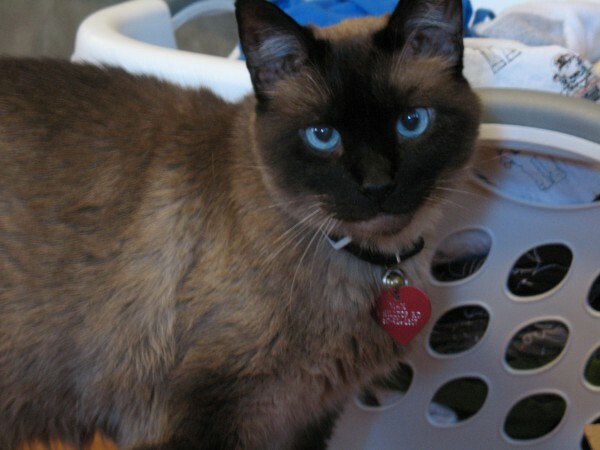 He wasn't a normal Siamese that way - he was rarely vocal. But last night he cried. This morning he cried. And we knew. I held him on my chest on the couch for a good long while, til the vet's office opened. I typed a little about it on Twitter as I was getting ready. We had said that we'd do anything as long as he had quality of life. As long as he was happy and purring. We said goodbye to our darling boy, and we told him how much we loved him and how incredibly lucky we were to have him, and we thanked him for being the best cat in the entire world. God, we were so lucky. So, so lucky to have been his family. There will be more later. More funny Max stories, more remembrance. You can leave your favorite Max memories in the comments if you like. But right now, Max was my best little buddy, my comfort, my darling boy, and releasing him today was the best thing for him, but I am... indescribable right now. We were all so fortunate to have had Max in our lives. He was a Cat of Love, we've always said. He was. I'm so glad you had each other, and so sorry for your loss. We were so lucky to have found each other. Perfect combination of family and cat. I am so sorry for your loss. I'll be thinking about you. Never, ever easy. But worth it, very worth it, for the times you had. He was beautiful inside and out from what you've written here. I said it on Facebook, but again I'm so sorry for your loss. I'm so sorry. He was lucky to have had all of you, too. He looks like a beautiful, beautiful cat. His memory for a blessing. Oh I am sorry. Blessed journey to the other side of the Rainbow Bridge, Max. I'm so sorry for your loss, but so glad you had him in your life. Oh, 'song. All the love to you. 30th-Nov-2013 08:41 pm (UTC) - So sorry for your loss. He sounds like the best pet who helps you remember you are loved and loveable.